When refrigeration and air conditioning equipment malfunctions, companies need an HVACR provider that is skillful at providing effective solutions designed to not only address immediate system performance issues but also to keep those systems running smoothly on a long-term basis. Quality Refrigeration has been successfully helping customers establish and maintain their HVACR systems for over 65 years. Throughout that time, we have been instrumental in shaping industry standards, forged partnerships with leading industry manufacturers, and consistently delivered superior work in a timelymanner, allowing customers to have all of the information, technology, and support they need so they can focus on their core business. Multi-generation family business – Refrigeration and air conditioning isn’t just a job to us – it’s a family. Quality Refrigeration has been maintaining customer relationships that have been built over generations. This rewarding opportunity has allowed us to grow in ways other companies cannot. Our expertise has been passed from one generation to the next, reinforced by the addition of passionate, service-oriented individuals and innovative technologies. This allows us to offer customers an enduring service relationship that will stand the test of time. Representatives for the industry’s leading manufacturers – In the HVACR industry, it is vital to thoroughly understand the products and technologies being implemented in order to give customers the most relevant systems for their particular application. As a representative for the leading industry manufacturers, our sales staff and technicians are experts on all of the products we sell, so customers can be assured they are receiving the finest products backed up by knowledgeable and expert service. For more information about the many types of equipment we sell, visit our Equipment and Parts page. 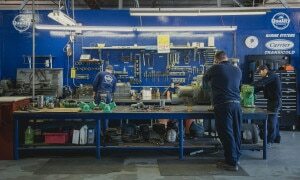 Large parts inventory – Our in-stock parts warehouse is one of the largest parts inventories in California, and the majority of refrigeration and air conditioning parts are easily accessible. When time is of the essence, access to readily available parts eliminates the waiting time associated with special orders. This helps to ensure that your refrigeration and air conditioning systems operate efficiently while experiencing minimal downtime. 24/7 service for existing customers – When refrigeration and air conditioning systems are malfunctioning, Quality Refrigeration understands that every second is crucial. You can count on our technicians, who are always on call 24/7 to help existing customers during emergencies. Experience with all types of industries – Although Quality Refrigeration was initially founded to address the needs of the marine industry, our client base has significantly grown and broadened over the years. Today we effectively service the HVACR needs of customers from a variety of industry segments, including marine, government, commercial, and industrial. Quick response time – Emergencies can happen at any moment, and Quality Refrigeration is here to help. We make it a priority to respond to all current customer emergencies within the hour. Proactive approach – Quality Refrigeration is invested in helping customers to get the most out of their products. That’s why we take a proactive approach by performing routine maintenance on your essential equipment, helping to prevent possible issues down the line while increasing the overall equipment lifespan. Quality University – Quality University is an on-going in-house training program that seeks to consistently educate all of our technicians in refrigeration and air conditioning technology updates and equipment. Educating our employees on the most modern products and techniques enables our customers to always have the most relevant and efficient technologies at their disposal. For more information, visit our Quality University page.